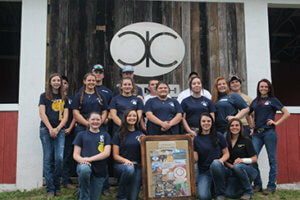 County Line Cattle Ranch in Lake County hosted a Farm to Table on March 31, 2018, benefitting the Umatilla High School FFA. Over 75 people were in attendance. The Farm to Table event boasted a four-course meal served with locally-grown produce and roast beef from the ranch itself. “We are here for the kids, we do what we can to give back. It’s really amazing to see the community come out to support FFA with such a big showing,” said Kevin Lucas, owner and operator of the ranch. The event was sponsored in part by the Lake County Farm Bureau and $6,000 was raised and donated to the program.